Sports-related minor traumatic brain injuries (mTBI) continue to incite concern among different groups in the medical, sports, and parenting community. At the recreational level, approximately 1.6–3.8 million related mTBI incidents occur in the United States every year, and in most cases, are not treated at the hospital. (See “The epidemiology and impact of traumatic brain injury: a brief overview” in Additional resources.) The estimated medical and indirect costs of minor traumatic brain injury are reaching $60 billion annually. The majority of players involved in hockey and football are not college or professional athletes. There are over 3 million youth hockey players and approximately 5 million registered participants in football. (See “Head Impact Exposure in Youth Football” in Additional resources.) These recreational athletes don’t have basic access to medical staff trained in concussion recognition and sideline injury assessment. A user-friendly measurement and a smartphone-based assessment tool would facilitate the process between identifying potential head injuries, assessment, and return to play (RTP) criteria. Recently, the use of instrumented sports helmets, including the Head Impact Telemetry System (HITS), has allowed for detailed recording of impacts to the head in many research trials. This practice has led to recommendations to alter contact in practices and certain helmet design parameters. (See “Head impact severity measures for evaluating mild traumatic brain injury risk exposure” in Additional resources.) However, due to the higher costs of the HITS system and complexity of the equipment, it is not a practical impact alert device for the general recreational population. A simple, practical, and affordable system for measuring head trauma within the sports environment, subject to the absence of trained medical personnel, is required. Given the proliferation of smartphones, we felt that this was a practical device to investigate to provide this type of monitoring. All smartphone devices have an embedded Bluetooth communication system to receive and transmit data at various ranges. For the purposes of this demonstration, we chose a class 1 Bluetooth device as the hardware communication method. We chose it because of its simplicity, widely accepted standard, and compatibility to interface with existing smartphones and IoT devices. Remote monitoring typically involves collecting information from devices (for example, wearables) at the edge, integrating that information into a data lake, and generating inferences that can then be served back to the relevant stakeholders. Additionally, in some cases, compute and inference must also be done at the edge to shorten the feedback loop between data collection and response. This use case can be extended to many other use cases in myriad verticals. In this two-part series, we show you how to build a data pipeline in support of a data lake. We use key AWS services such as Amazon Kinesis Data Streams, Kinesis Data Analytics, Kinesis Data Firehose, and AWS Lambda. In part 2, we focus on generating simple inferences from that data that can support RTP parameters. Note: For the purposes of our demonstration, we chose to use heart rate monitoring sensors rather than helmet sensors because they are significantly easier to acquire. Both types of sensors are very similar in how they transmit data. They are also very similar in terms of how they are integrated into a data lake solution. AWS Greengrass set up with a Raspberry Pi 3 to stream heart rate data into the cloud. Data is ingested via Amazon Kinesis Data Streams, and raw data is stored in an Amazon S3 bucket using Kinesis Data Firehose. Find more details about writing to Kinesis Data Firehose using Kinesis Data Streams. AWS Lambda enriches the heartbeat data by comparing the real-time data with baseline information stored in Amazon DynamoDB. AWS Lambda sends SMS/email alerts via an Amazon SNS topic if the heartbeat rate is greater than 120 BPM, for example. AWS Glue runs an extract, transform, and load (ETL) job. This job transforms the data store in a JSON format to a compressed Apache Parquet columnar format and applies that transformed partition for faster query processing. AWS Glue is a fully managed ETL service for crawling data stored in an Amazon S3 bucket and building a metadata catalog. Amazon Athena is used for ad hoc query analysis on the data that is processed by AWS Glue. This data is also available for machine learning processing using predictive analysis to reduce heart disease risk. Amazon QuickSight is a fully managed visualization tool. It uses Amazon Athena as a data source and depicts visual line and pie charts to show the heart rate data in a visual dashboard. All data pipelines are serverless and are refreshed periodically to provide up-to-date data. You can use Kinesis Data Firehose to transform the data in the pipeline to a compressed Parquet format without needing to use AWS Glue. For the purposes of this post, we are using AWS Glue to highlight its capabilities, including a centralized AWS Glue Data Catalog. This Data Catalog can be used by Athena for ad hoc queries and by Apache Spark EMR to run complex machine learning processes. AWS Glue also lets you edit generated ETL scripts and supports “bring your own ETL” to process data for more complex use cases. The following sections describe how to set up and configure the devices and services used in the demonstration to build a data pipeline in support of a data lake. You can use commercially available heart rate monitors to collect electrocardiography (ECG) information such as heart rate. The monitor is strapped around the chest area with the sensor placed over the sternum for better accuracy. The monitor measures the heart rate and sends the data over Bluetooth Low Energy (BLE) to a Raspberry Pi 3. The following figure depicts the device-side architecture for our demonstration. The Raspberry Pi 3 is host to both the IoT device and the AWS Greengrass core. The IoT device is responsible for connecting to the heart rate monitor over BLE and collecting the heart rate data. The collected data is then sent locally to the AWS Greengrass core, where it can be processed and routed to the cloud through a secure connection. The AWS Greengrass core serves as the “edge” gateway for the heart rate monitor. To prepare your Raspberry Pi for running AWS Greengrass software, follow the instructions in Environment Setup for Greengrass in the AWS Greengrass Developer Guide. After setting up your Raspberry Pi, you are ready to install AWS Greengrass and create your first Greengrass group. Create a Greengrass group by following the steps in Configure AWS Greengrass on AWS IoT. Then install the appropriate certificates to the Raspberry Pi by following the steps to start AWS Greengrass on a core device. The preceding steps deploy a Greengrass group that consists of three discrete configurable items: a device, a subscription list, and the connectivity information. The core device is a set of code that is responsible for collecting the heart rate information from the sensor and sending it to the AWS Greengrass core. This device is using the AWS IoT Device SDK for Python including the Greengrass Discovery API. To complete the setup, follow the steps in Create AWS IoT Devices in an AWS Greengrass Group. Here, your device is named Heartrate_Sensor, and the target is the IoT Cloud on the topic iot/heartrate. That means that when your device publishes to the iot/heartrate topic, AWS Greengrass also sends this message to the AWS IoT Core service on the same topic. Then you can use the breadth of AWS services to process the data. The connectivity information is configured to use the local host because the IoT device resides on the Raspberry Pi 3 along with the AWS Greengrass core software. The IoT device uses the Discovery API, which is responsible for retrieving the connectivity information of the AWS Greengrass core that the IoT device is associated with. The power of AWS Greengrass core is that you can deploy AWS Lambda functions and new subscriptions to process the heart rate information locally on the Raspberry Pi 3. For example, you can deploy an AWS Lambda function that can trigger a reaction if the detected heart rate is reaching a set threshold. In this scenario, different individuals might require different thresholds and responses, so you could theoretically deploy unique Lambda functions on a per-individual basis if needed. To enable further processing and storage of the heart rate data messages published from AWS Greengrass core to AWS IoT Core, create an AWS IoT rule. 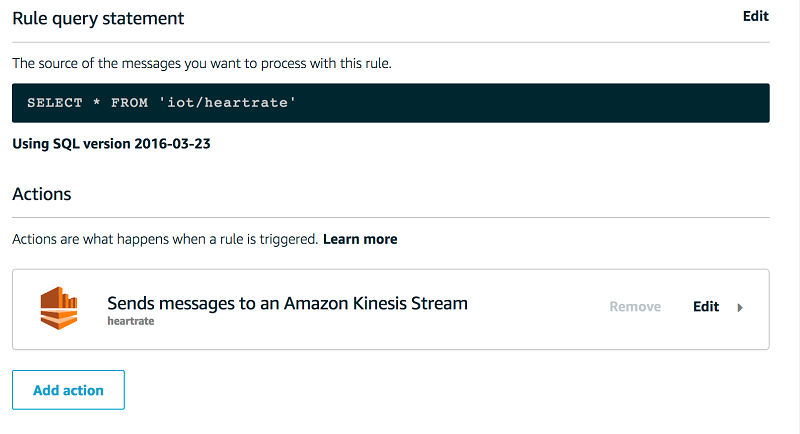 The AWS IoT rule retrieves messages published to the IoT/heartrate topic and sends them to the Kinesis data stream through an AWS IoT rule action for Kinesis action. You might not have access to an IoT device, but you still want to run a proof of concept (PoC) around heart rate use cases. You can simulate data by creating a shell script and deploying that data simulation script on an Amazon EC2 instance. Refer to the EC2 user guide to get started with Amazon EC2 Linux instances. On the Amazon EC2 instance, create a shell script kinesis_client_HeartRate.sh, and copy the provided code to start writing some records into the Kinesis data stream. Be sure to create your Kinesis data stream and replace the variable <your_stream_name> in the following script. You can also use the Kinesis Data Generator to create data and then stream it to your solution or demonstration. 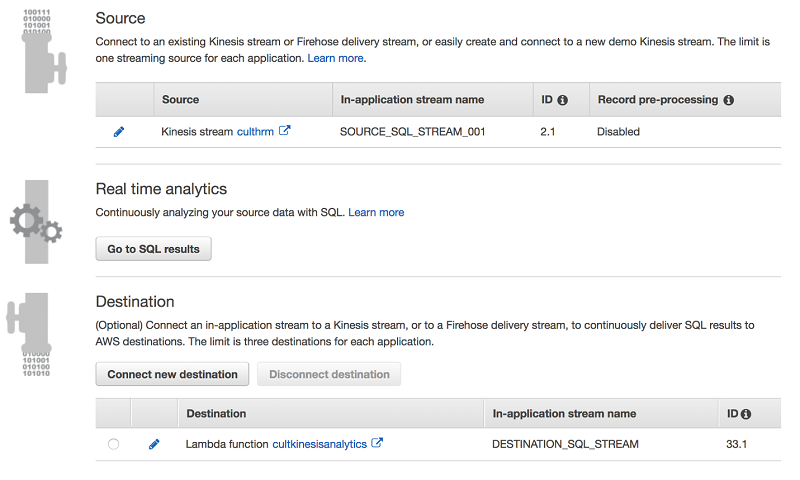 For details on its use, see the blog post Test Your Streaming Data Solution with the New Amazon Kinesis Data Generator. Now you need to ingest data from the IoT device, which can be processed for real-time notifications when abnormal heart rates are detected. Streaming data from the heart rate monitoring device is ingested to Kinesis Data Streams. 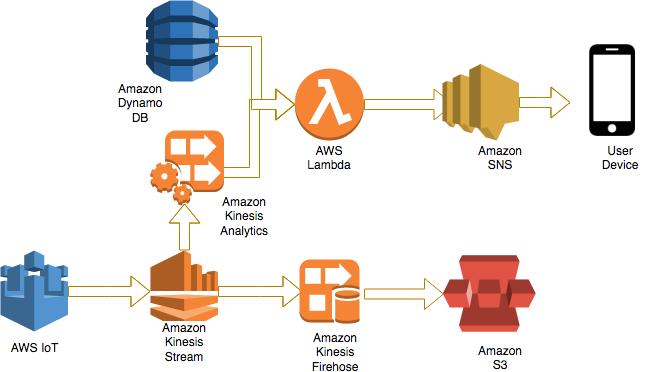 Amazon Kinesis makes it easy to collect, process, and analyze real-time, streaming data. For this project, the data stream was configured with one open shard and a data retention period of 24 hours. This lets you send 1 MB of data or 1,000 events per second and read 2 MB of data per second. If you need to support more devices, you can scale up and add more shards using the UpdateShardCount API or the Amazon Kinesis scaling utility. You can configure your data stream by using the following AWS CLI command (and then using the appropriate flag to turn on encryption). You can use an AWS CloudFormation template to create the entire stack depicted in the following architecture diagram. Alternatively, you can follow the manual steps in the documentation links that are provided in this post. Streaming data in Kinesis can be processed and analyzed in real time by Kinesis clients. Refer to the Kinesis Data Streams Developer Guide to learn how to create a Kinesis data stream. To identify abnormal heart rate information, you must use real-time analytics to detect abnormal behavior. You can use Kinesis Data Analytics to perform analytics on streaming data in real time. Kinesis Data Analytics consists of three configurable components: source, real-time analytics, and destination. Refer to the AWS documentation to learn the detailed steps to configure Kinesis Data Analytics. Kinesis Data Analytics uses Kinesis Data Streams as the source stream for the data. In the source configuration process, if there are scenarios where in-filtering or masking records is required, you can preprocess records using AWS Lambda. The data in this particular case is relatively simple, so you don’t need preprocessing of records on the data. The Kinesis Data Analytics schema editor lets you edit and transform the schema if required. In the following example, we transformed the second column to Value instead of COL_Value. The SQL code to perform the real-time analysis of the data has to be copied to the SQL Editor for real-time analytics. The following is the sample code that was used for this demonstration. This code generates DESTINATION_SQL_STREAM. It inserts values into the stream only when the average value of the heart beat that is received from SOURCE_SQL_STREAM_001 is greater than 120 or less than 40 in the 60-second time window. For more information about the tumbling window concept, see Tumbling Windows (Aggregations Using GROUP BY). 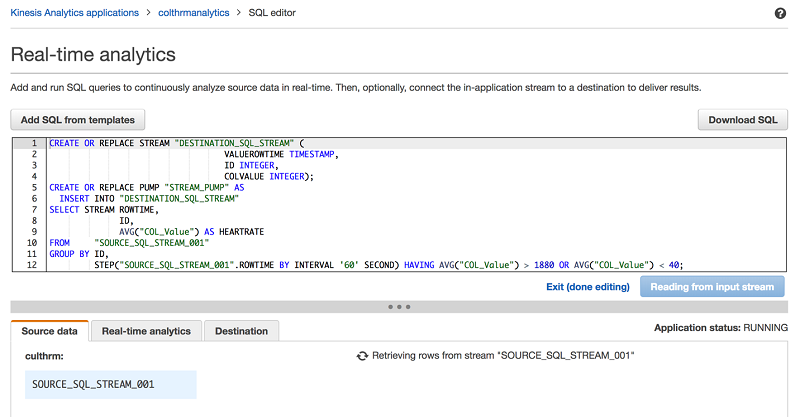 In the destination editor, make sure that the stream name selected is the DESTINATION_SQL_STREAM. You only want to trigger the Lambda function when anomalies in the heart rate are detected. The output format can be JSON or CSV. In this example, our Lambda function expects the data in JSON format, so we chose JSON. Athlete and athletic trainer registration information is stored in the heartrate Registrations DynamoDB table. Amazon DynamoDB offers fully managed encryption at rest using an AWS Key Management Service (AWS KMS) managed encryption key for DynamoDB. You need to create a table with encryption at rest enabled. Follow the detailed steps in Amazon DynamoDB Encryption at Rest. Each record in the table should include deviceid, customerid, firstname, lastname, and mobile. The following is an example table record for reference. Refer to the DynamoDB Developer Guide for complete instructions for creating and populating a DynamoDB table. The Lambda function is created to process the record passed from the Kinesis Data Analytics application. The node.js Lambda function retrieves the athlete and athletic trainer information from the DynamoDB registrations table. It then alerts the athletic trainer to the event by sending a cellular text message via the Amazon Simple Notification Service (Amazon SNS). Note: The default AWS account limit for Amazon SNS for mobile messages is $1.00 per month. You can increase this limit through an SNS Limit Increase case as described in AWS Service Limits. You now create a new Lambda function with a runtime of Node.js 6.10 and choose the Create a custom role option for IAM permissions. If you are new to deploying Lambda functions, see Create a Simple Lambda Function. You must configure the new Lambda function with a specific IAM role, providing privileges to Amazon CloudWatch Logs, Amazon DynamoDB, and Amazon SNS as provided in the supplied AWS CloudFormation template. The provided AWS Lambda function retrieves the HR Monitor Device ID and HR Average from the base64-encoded JSON message that is passed from Kinesis Data Analytics. After retrieving the HR Monitor Device ID, the function then queries the DynamoDB Athlete registration table to retrieve the athlete and athletic trainer information. Finally, the AWS Lambda function sends a mobile text notification (which does not contain any sensitive information) to the athletic trainer’s mobile number retrieved from the athlete data by using the Amazon SNS service. 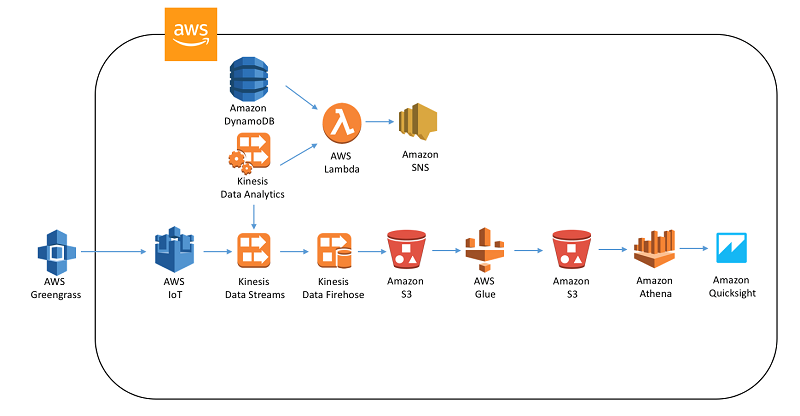 To store the streaming data to an S3 bucket for further analysis and visualization using other tools, you can use Kinesis Data Firehose to connect the pipeline to Amazon S3 storage. To learn more, see Create a Kinesis Data Firehose Delivery Stream. Kinesis Data Firehose delivers the streaming data in intervals to the destination S3 bucket. The intervals can be defined using either an S3 buffer size or an S3 buffer interval (or both, whichever exceeds the first metric). The data in the Data Firehose delivery stream can be transformed. It also lets you back up the source record before applying any transformation. The data can be encrypted and compressed to GZip, Zip, or Snappy format to store the data in a columnar format like Apache Parquet and Apache ORC. This improves the query performance and reduces the storage footprint. You should enable error logging for operational and production troubleshooting. In part 1 of this blog series, we demonstrated how to build a data pipeline in support of a data lake. We used key AWS services such as Kinesis Data Streams, Kinesis Data Analytics, Kinesis Data Firehose, and Lambda. In part 2, we’ll discuss how to deploy a serverless data lake and use key analytics to create actionable insights from the data lake. Langlois, J.A., Rutland-Brown, W. & Wald, M., “The epidemiology and impact of traumatic brain injury: a brief overview,” Journal of Head Trauma Rehabilitation, Vol. 21, No. 5, 2006, pp. 375-378. Daniel, R. W., Rowson, S., Duma, S. M., “Head Impact Exposure in Youth Football,” Annals of Biomedical Engineering., Vol. 10, 2012, 1007. If you found this post useful, be sure to check out Setting Up Just-in-Time Provisioning with AWS IoT Core, and Real-time Clickstream Anomaly Detection with Amazon Kinesis Analytics. Saurabh Shrivastava is a partner solutions architect and big data specialist working with global systems integrators. He works with AWS partners and customers to provide them architectural guidance for building scalable architecture in hybrid and AWS environments. Abhinav Krishna Vadlapatla is a Solutions Architect with Amazon Web Services. He supports startups and small businesses with their cloud adoption to build scalable and secure solutions using AWS. During his free time, he likes to cook and travel. John Cupit is a partner solutions architect for AWS’ Global Telecom Alliance Team. His passion is leveraging the cloud to transform the carrier industry. He has a son and daughter who have both graduated from college. His daughter is gainfully employed, while his son is in his first year of law school at Tulane University. As such, he has no spare money and no spare time to work a second job. David Cowden is partner solutions architect and IoT specialist working with AWS emerging partners. He works with customers to provide them architectural guidance for building scalable architecture in IoT space. Josh Ragsdale is an enterprise solutions architect at AWS. His focus is on adapting to a cloud operating model at very large scale. He enjoys cycling and spending time with his family outdoors. Pierre-Yves Aquilanti, Ph.D., is a senior specialized HPC solutions architect at AWS. He spent several years in the oil & gas industry to optimize R&D applications for large scale HPC systems and enable the potential of machine learning for the upstream. He and his family crave to live in Singapore again for the human, cultural experience and eat fresh durians. Manuel Puron is an enterprise solutions architect at AWS. He has been working in cloud security and IT service management for over 10 years. He is focused on the telecommunications industry. He enjoys video games and traveling to new destinations to discover new cultures.